Don’t you love the idea of being able to use all of something? My friend, Karen at http://findingmerle.com and I have been talking about our relatives who survived the Great Depression and how they learned to use nearly everything they had. For instance, my grandparents had gardens, fruit trees and fruit bushes. Anything with a berry on it was fair game. I remember picking gooseberries with grandma. Have you ever had gooseberries? Woo! They are sour! But, with lots of sugar, they make a good pie. At the end of summer, their cellars were always packed with the fruits and vegetables they “put up” (canned) to eat during the winter. Karen mentioned wishing she had her great grandmother’s Watermelon Pickles recipe. I have my grandma’s recipe, so I thought it’d be fun to share it. Cut melon in cubes and let stand overnight in salted water (brine). Drain. Cover with fresh cold water, bring to boil and cook over low heat til tender. Drain. Combine ingredients above and boil 5 minutes. Add melon cubes and simmer til transparent. Pour in sterilized hot jars and seal. I haven’t tried this recipe yet. So, as long as the rabbits don’t eat all of my melons, I hope to make some watermelon pickles later on this summer. I’m going to take a cue from generations past and instead of filling my trash can with all the watermelon rinds, I’d love to live like they did and be graced with no waste. Watermelon pickles!! Sounds intriguing – let us know how you get on. I agree though, it was a wonder how much fruit was made into jams etc. My grandmother (and later my grandfather) every year would make litres of pears for the winter. Cooking the pears from their two giant trees in water and adding a ton (or so it seemed!) of sugar. Delicious!! Especially when warmed slightly after the freezer and added to vanilla ice-cream. Oh, I’m sad now…haven’t had any of that for years..
Oh my gosh, Annika! Those pears sound dreamy! Yum! Especially over ice cream. I’m sad, you’re sad. Maybe someone has the recipe? I bet you’re right about the sugar. Seems like I remember a lot of sugar in the old recipes. As my mom always says, everything in moderation. I’m betting they didn’t sit down and eat a whole jar by themselves at once. Probably made it last. Less sugar at once! Ha! No, a good kind of sad. Just brought back great memories and strange how I can see them so clearly in my head, even garner the scents from the house, hear their comments.I know, what was it with SUGAR!! I like your idea of moderation! I wish you had Orah’s recipe, too! So you could share with me!! :) Wish I could’ve met your dad. Bet he had some great lessons. 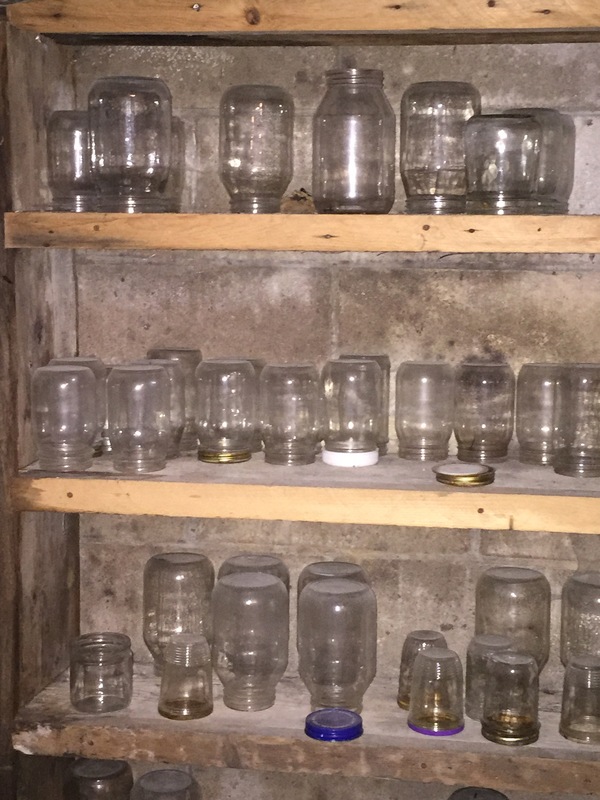 The jars are my other grandma’s (Wilma). There’s a cellar type room in her basement. It was one of those doors we were afraid to open when we were kids. One of those creepy “what’s in THERE” rooms! Ten years. Bet you miss him. Glad he’s with you! Fingers crossed for the recipe. :) I’ll be listening for that holler! Your dad?? You rarely mention him! I love this! I’m sorry to hear they passed before you were born. They missed out on knowing a heck of a wonderful girl! I’ll share all I’ve got! Oh no. Cancer is so mean. :( I’m glad good memories are coming back. Canning is an art my grandmother did, and I still remember looking at the mason jars full of jam in her garage when I was a child. Someday I will take up the art of canning, just for the fun of it! Oh! What a great picture I have in my mind of a child admiring jars of jam. :) When you start your canning art, let me know, will ya?